Direct mail remains a highly effective marketing tool for the retail industry as a whole and independent bicycle retailers specifically. SmartEtailing is committed to serving our clients with the best marketing tools and direct mail is an essential part of our toolkit. Because direct mail represents a significant investment for independent retailers we believe that expert consultation is a crucial piece in delivering a premium product to our clients. We take a hands-on approach to direct mail marketing. We utilize a precise and intensive process to evaluate and rank customer lists to maximize response rate for every mailer. We customize every design to ensure that messaging, graphics and offers attract shoppers and increase transaction size. We are profoundly focused on generating the highest return on investment for every client on every project. In June, we promoted Ray Kennedy to the position of Direct Mail Consultant in order to manage this complex and effective marketing product. Ray will work side-by-side with his predecessor Corey Atkinson through the summer in order to meet our many clients and learn the logistical details of the SmartEtailing direct mail operation. Ray is not new to SmartEtailing or retail marketing. Ray started with Harvest Retail Marketing in 2015 and transitioned to join SmartEtailing with the merger of the two companies in 2016. During that time Ray has ascended to become our most prolific Account Manager and has managed all aspects of marketing for many of the nation’s largest independent bicycle retailers. You will likely be meeting Ray over the coming months as he calls to introduce himself. We thought we’d help you get to know Ray a little better so we asked Andrew Smith from our Marketing Strategy team to sit down with Ray to ask him a few questions. To get things going, could you tell me when cycling became a part of your life? I really started getting into bikes when I got my first name-brand mountain bike for my 13th birthday. It was a big deal, and I rode it 5 miles to school almost every day. Freshman year of high school I saved up for a full-suspension mountain bike using two summers of lawn mowing money. It was funny, I rarely rode that bike on trails, despite it being an awesome trail bike. Those summers I probably rode about 3,000 miles on the pavement – going through more tires than I can remember. The next year my parents generously gave me my first road bike, an aluminum Trek. It was the perfect next step and what really got me hooked on cycling. It was what helped me get up at 5am on a school day, even after studying late the night before. At this point I was all-in with bikes. I had started working at Penn Cycle that spring, and my store manager Jimmie showed me the ropes. I’ve never looked back. Now I’m determined to be a lifelong cyclist. That’s cool. What are you riding these days? I’m a bit of a rarity at SmartEtailing in that I only have one functional bike these days. I’m riding a Colnago C59. I ride it on pavement and gravel. I have an old Paramount mountain bike that I’ll eventually get working. I’m looking for a gravel bike or maybe a mountain bike at some point. Nice. I’m right there with you on the hunt for more bicycles. Your current position as an Account Manager is primarily a marketing role. How did you get into marketing? I got into marketing in college. I moved to Omaha, NE to earn my marketing degree from Creighton University. In the summers I’d balance marketing internships back home in Minneapolis along with my time at Penn Cycle. The summer before my senior year I realized that I wanted to more deliberately blend my passions of cycling and marketing together and by a twist of fate it happened that Harvest Retail Marketing was located in Omaha. All they did was marketing for bike shops. I started that summer as a Marketing Assistant at Harvest and worked my way from the ground up into role of Account Manager. It has been a thrilling journey. I’m so lucky that life took me down this path. I’ve learned so much from the people that I work with. What about marketing do you like the most? Being a great partner to our clients. I view customer service today the same way I did when I worked at the bike shop. Treat people well, understand their needs and offer expert advice. Care about how they spend their hard-earned money. I’m super focused on helping my clients spend their money efficiently. I like focusing on getting engagement from consumers as my first priority. Ultimately I’m working towards helping clients grow their sales and profit but the strategy to make that happen involves a lot of complex tactical decision making. I like working with business owners to understand what is unique about their brand, what their customers are buying, what their business needs are -- and then informing their marketing based on what I’ve learned over the years. You’re transitioning to this new position working with direct mail. What are you looking forward to the most? Honestly, the same thing I’ve looked forward to over the past few years. Coming into work and talking to bike shops. The new role will give me a greater opportunity to work with more shops. I work with a small group of great shops now as their contract marketing manager. This opportunity let’s me get to know so many more people and tune into what is happening around the country. That’s the best part of the job, getting to have a great conversation with people who love bicycle retail as much as I do. I was going to ask you what your big motivator was, but it sounds like you just really enjoy helping people out with their shops. Yeah, that’s my biggest motivator. Helping independent bicycle retailers thrive in a changing world. Bike shops are at the head of that effort, working with consumers directly every day, but I like to think we play a small, behind-the-scenes role in helping get more people aware of the shops and through their doors. Will it be a difficult change going from digital to physical marketing? You know, fundamentally the tools are very similar. If you compare an email blast to a direct mail piece, they have a common objective; attract attention, quickly inform recipients and have compelling information to inspire a consumer to take action. There are small tactical differences, but there is a ton of information in our own records and in the direct marketing world about what works and doesn’t work so I’m excited to learn more over time. Logistically this is a whole new challenge. With an email blast I have nearly complete control. I obviously work with a graphic designer on all of the visual elements but I typically manage all other components and hit “send” when ready. With direct mail, there is a complex mechanism behind production and delivery that will take time to learn. Not to mention all of the nuance around evaluating customer lists and project objectives in order to determine the right profile for every project. There will be a lot to learn, but I’m excited. SmartEtailing, and Harvest before that, have been working with direct mail for bike shops for ten years and the systems are really dialed in. I’ve got really good mentors within the company and with our many production partners. If you could have any bike in the world, money's no object, which bike would it be? That’s a tough question. I would probably have to say, a Pegoretti. Or anything classic and unique that has a story behind it. It would be steel, 100% though. With a classic Campy grouppo. That would be my pick. Last question, what is your favorite animal? It’s hard to beat a dog. We have a terrier/cocker spaniel at home named Nellie, and she’s awesome. If I chose another animal I think she would feel bad (ha-ha). If I was going a little more interesting though, I’d say a moose. Moose are great. I like moose because they are little bit awkward, they’re adventurous, and live in some of my favorite places, like Colorado, the UP of Michigan, the North Shore of Minnesota. I have never seen one, no. That’s part of their mystique I think. I can’t wait for the day that I’m able to see a moose. A guy can dream, right? Ray is a great example of the people who work here at SmartEtailing. His passion for cycling, marketing, and helping our clients the best he can is why we love working with him. We hope that you will too. 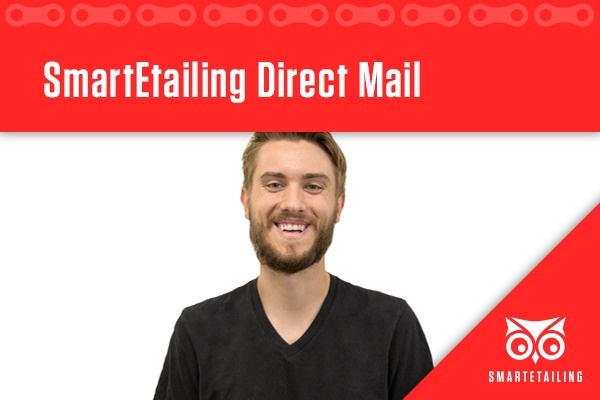 Learn more about Summer Direct Mail from SmartEtailing. Get started today!